Publisher: Chick Lit Goddess, LLC. *Disclaimer: I received an e-copy of this book from Neverland Blog Tours in exchange for an honest review. This does not influence my rating or the content of my review in any way. This was such a sweet story, perfect for this time of year, and I had a great time reading it. 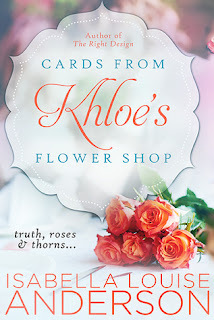 Cards From Khloe's Flower Shop is a story about second chances and love. But while romantic love does play an important role in this book, self love also has an important role to play in this book, which I absolutely adored. This book tells the story of three different women: Khloe, owner of a flower shop, Gabby, recently widowed, and Connie, a young woman who hasn't yet found her path. All women get their second chances at love and at a better life story, and it was such an incredible journey. Khloe is the owner of her own business, a flower shop, and through it she manages to put a smile on people's faces. Her personal life isn't the one she'd like, though. Having been hurt badly by her ex boyfriend, someone she trusted completely and someone she loved dearly, she is afraid of putting herself out there and trust another man like she trusted her ex. 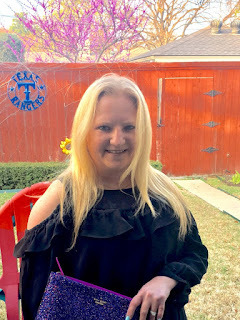 Her story is more about healing and about learning that not everyone will abuse her trust. While she is dreaming of finding that perfect man, she is terrified that history will repeat itself. I liked how her story went, and I understood some of the things she did and said, especially when she was sure Derek might have not been as deserving of her trust as she initially thought. Gabby's story was so sweet. She is trying to get over her husband's death and the pain of losing the one person she loved, and she decides to try finding someone. I don't believe she intended to find love again. Gabby gave me the impression she was just looking for companionship, and I was very happy to see her finding a great man and a great family. I truly loved Gabby, and seeing her happy brought a smile to my face every time I read her scenes. Connie's story was very inspiring. While the other women were learning about second chances and moving on from the pain of their pasts, Connie is learning to love herself, which is just as important, if not more so than loving another person. Connie went through a pretty awful childhood, having lost her parents and sister in a car accident. On top of that, she is struggling with loving herself and seeing how beautiful she truly is. She's constantly comparing herself with other women who she sees as beautiful, and having some bad experiences with her peers since she was young has made her very shy. In an attempt to make her female colleagues notice her, she decides to start sending herself flowers at work, as if they were from her supposed boyfriend. Along the way, she finds her Prince Charming, but her lack of self confidence rears its ugly head and ruins her relationship. Her struggles with accepting herself were hard to read, because in a way her story is so relatable. I loved seeing how Connie realized that the person she needed to be in her life was herself, and that she needed to fight for what she wanted. It was probably my favorite story of the three. I probably said this in the past, but if there's a reason I love chick lit, this is it. Anderson managed to capture the heart of this genre, which is basically telling the story of something important in a seemingly easy way. This time the lessons were not only important, but so current: loving yourself, accepting yourself, trusting others and trying again. I loved the pacing, and I read this book in one sitting. All in all, I had fun reading this book and I'll definitely keep an eye out for this author.